My standby recipe for stuffed zucchini has always been with a tomato sauce, thickened with oats and topped with cheese, but I’ve branched out with this one and decided to go for a more Middle Eastern/Sicilian flavour. These are a teeny bit more labour intensive than the tomato/cheese zucchini, but are a bit more classy. 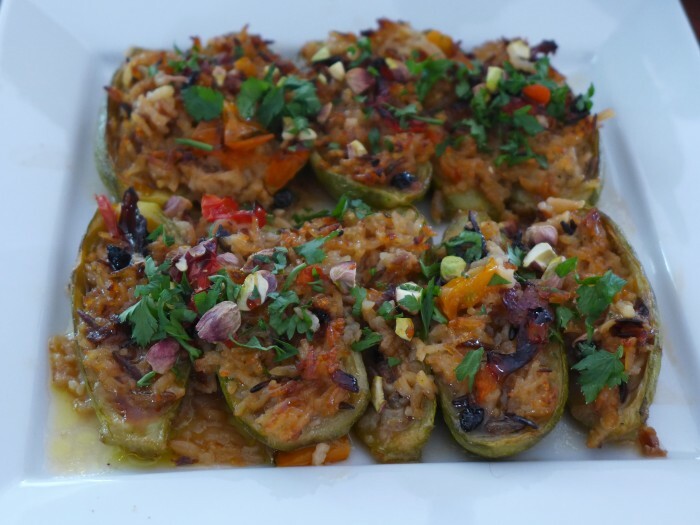 They are stuffed with a filling of cooked rice, caramelised onions, currants and parsley, cooked in a tomato, olive oil, lemon and water broth that is reminiscent of stuffed vine leaves and dressed with pomegranate molasses, parsley and pistachios. I thought about making these because I had some nice little lebanese zucchini and some leftover cooked rice. The traditional way to do these would be to scoop out the centres and stuff them whole and cook them in a saucepan like vine leaves, but I failed totally when trying to hollow them out. They kept breaking so I decided, after a couple of accidents, to split them lengthwise and stuff them that way and bake them in the oven. They are really truly delicious. Unctuous, soft, sweet, salty, lemony and tart. This is the first time I’ve ever made them and I know they will become a part of my regular summer zucchini recipe collection. Split the zucchini lengthwise and scoop out the centres with a teaspoon and arrange in a single layer in a baking dish with the hollowed out sides facing up. Fill with the rice mixture. Scatter the diced tomato across the top and sprinkle with salt. Mix the lemon juice, zest, tomato puree, olive oil and a cup of water and pour carefully into the baking dish. Do not pour on top of the rice mix. Drizzle with some extra olive oil. Bake covered for 50 minutes at 200C. Remove from the oven and spoon the liquid over the rice filling. Bake uncovered for a further 10 minutes. Remove from the oven, spoon the remaining liquid over the rice filling again. Allow to come to room temperature and scatter with parsley and chopped pistachios and drizzle some pomegranate molasses over the top.